The National Conference chief met West Bengal Chief Minister Mamata Banerjee here on Friday and held talks on the probable opposition front. 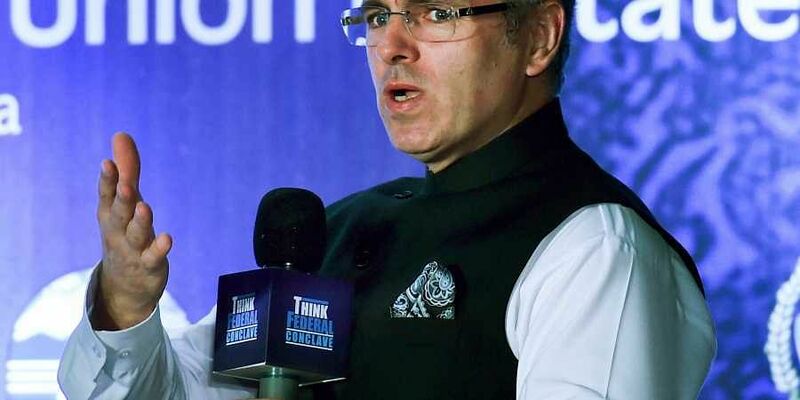 KOLKATA: National Conference (NC) leader Omar Abdullah said the Congress has to be the "backbone" of the opposition unity with its chief Rahul Gandhi at the forefront of the campaign for the 2019 Lok Sabha polls to oust the BJP from power at the Centre. This, however, does not minimise the responsibility of regional leaders who are strong in their own states, Abdullah told PTI here in an interview. "The Congress has to be the backbone as the lion's share of seats of the opposition in one particular party will have to be from it as there are a number of states where there will be direct contest between the Congress and the BJP," he said. "At the end of the day to form a government at the Centre you need 272 seats, which the regional outfits are not going to get. You will be looking towards the Congress to come close to the 100-seat mark, if not cross it to form a non-BJP government," he said. Abdullah met West Bengal Chief Minister Mamata Banerjee here on Friday and held talks on the probable opposition front. Efforts to cobble up an opposition front is gaining momentum, but a section of leaders of regional parties are not keen on letting the Congress lead it and are propagating a non-BJP and non-Congress front. On the issue of Rahul Gandhi being the face of the opposition, Abdullah said he being the president of the single largest opposition party was expected to be at the forefront of the election campaign. "Obviously, one will expect Rahul Gandhi to be at the forefront of leading the election campaign in 2019 but at the same time Sonia Gandhi is the leader of the UPA. Therefore to the best possible extent one will hope Sonia Gandhi will also be part of the campaign," he said. Refuting aspersions on Rahul Gandhi's leadership capabilities, Abdullah cited the example of Congress' role in forming the government in Karnataka and said he had shown a lot of maturity on how the party was orienting itself. "He is president of the Congress party. If anybody has any doubt about his leadership quality then it has to be from his party. His party has absolutely no problem with him, then why should anybody else have objections?" Abdullah said. "Rahul Gandhi has shown a lot of maturity on how the Congress is orienting. He is a leader in his own right and he has every right to be there," the NC leader said. He, however, maintained that the issue of the "face of opposition" is being brought up to divide the opposition unity. "Individual regional parties are strong in their own states." Mamata Banerjee will lead the fight against the BJP in West Bengal, while in Bihar, the anti-BJP face will be that of Lalu Prasad (RJD) supported by the Congress. In UP, the faces will be Akhilesh Yadav (SP) and Mayawati (BSP) and in Tamil Nadu, it will be Karunanidhi (DMK) and his son M K Stalin, he said. "The Congress by virtue of its pan-India presence will have greater responsibility, but that's not to minimise the responsibility of other (regional) leaders. They would play a vital role. It's very important that we fight tactfully and tactically and this is the way forward," he said. Abdullah, who was in the city to take part in 'Think Federal Conclave', said NC was very much a part of the grouping of regional parties opposed to the BJP. "I would like them (grouping) to have clear an agenda regarding all the issues that matter to the country ranging from creation of jobs, demonetisation, the way economy has been handled. And obviously, they have to look at both facets of Jammu and Kashmir. One is Pakistan as our (India) relations with it impact the situation in J&K and secondly, internally all the problems that have happened in the state after 2014 should be addressed by it," he said. Speaking on the present situation in Kashmir, Abdullah said the dismissal of the Mehbooba Mufti government by the Centre showed how the state was "mishandled" since 2015. "The present situation in the valley is not at all conducive for holding elections," he said. Listing steps that needed to be taken to restore peace in Kashmir, he said the alleged efforts of horse trading of PDP MLAs should immediately stop. "The J&K Assembly needs to be dissolved rather than simply suspended. Then the governor needs to work towards reducing the levels of violence so that some semblance of peace is restored." Speaking on the prevailing situation in the country, he said attempts were being made to vitiate the atmosphere of communal harmony. The way the entire community, particularly the Muslim community, was sought to be vilified is a matter of "grave concern," he said, adding that when these were stray voices from the people who didn't matter it was understandable to an extent. "But now you have elected representatives from the ruling party (BJP) who are espousing very strong anti-Muslim sentiments and trying to spread that in the country, which is a matter of grave concern," Abdullah said. Your party has also no problem with you. Then why should others?